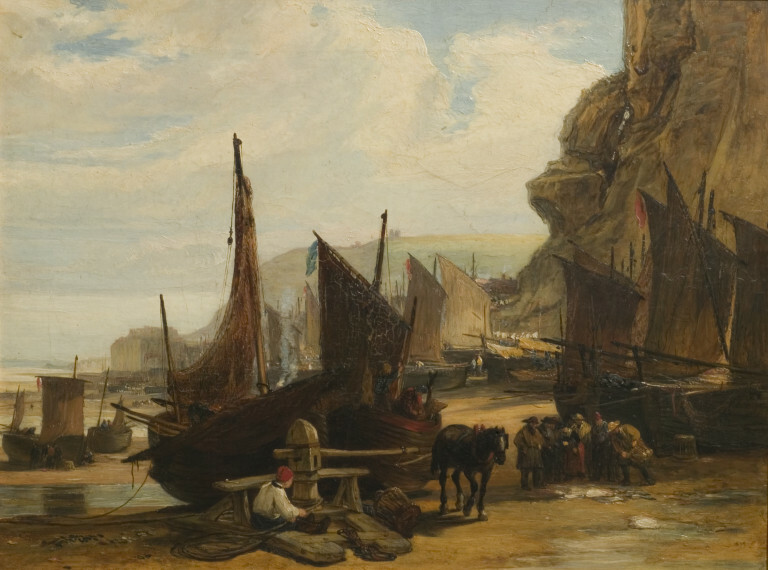 Coast scene showing figures in foreground, cliffs to the right and boats afloat in the background. Given by John Sheepshanks, 1857. John Sheepshanks (1787-1863), art collector, was the son of the wealthy cloth manufacturer and merchant Joseph Sheepshanks. John succeeded his father in the family firm of York and Sheepshanks in Leeds. After his retirement from business in 1827, John Sheepshanks moved to London. He made several trips to the Continent but lived relatively modestly. Apart from art, Sheepshanks was interested in gardening and was a member of both the Royal Horticultural Society and the Athenaeum Club. Sheepshanks liked to pursue his interest in art by entertaining painters and engravers at informal Wednesday "at homes". Sheepshanks began his interest in art through collecting books of Dutch and Flemish prints. Before he moved to London he made purchases at the Northern Society in Leeds. In London he actively patronized artists including Landseer, Mulready, Leslie, Callcott and Cooke. His taste was for contemporary early Victorian cabinet pictures of anecdotal, sentimental, and instructive subjects, as well as scenes from literature. His collection was unique for its time being the only large scale one of contemporary British paintings. He gave his collection of 233 oils and 298 watercolours, etchings and drawings to the South Kensington museum in 1857 (see departmental file on Sheepshanks). The deed of gift stipulated that "a well-lighted and otherwise suitable" gallery should be built to house his collection near the buildings of the Science and Art department on the South Kensington Site. This followed Sheepshanks' wish to create a 'gallery of British art'. The Sheepshanks Gallery was opened in 1857. Historical significance: John Burnet was born in Musselburgh, Edinburghshire in 1784. He studied under Leeshman, the teacher of Sir Walter Scott, before being apprenticed for seven years to the engraver Robert Scott. During his apprenticeship the young Burnet also continued to paint and studied under John Graham at the Trustees’ Academy in Edinburgh, where his fellow students included David Wilkie (1785-1841). In 1806 Burnet settled in London and there made contact with his friend Wilkie, who had arrived a year earlier and was enjoying the success of his paintingThe Village Politicians (exhibited at the Royal Academy in 1806). After the peace of 1814 Burnet spent five months in Paris to study masterpieces in the Louvre. In London he worked on projects producing prints after contemporary artists, including his friend Wilkie, work as well as painting genre and landscape scenes. These paintings were exhibited mainly at the British institution, although the artist also exhibited at the Royal Academy from 1808. While he worked predominantly painting genre paintings in the style of both his older brother James Burnet (1788-1816) and David Wilkie, John also produced landscapes like Fish Market at Hastings.Tall cliffs frame the painting on the right. The line of these dramatic cliffs lead out eyes into the distance of the coast, where fishing boats are sailing, and also up in to the white clouds that have been swept in to large, dramatic forms by the sea breeze. In the centre foreground a horse pulls a fishing boat on to the shore. The prominence of this boat emphasises the theme of fishing. Framed by another boat under the cliffs on the right of the painting, a group of six fishermen stand showing their catch to a woman. Her red skirt breaks up the composition and draws our attention to the group. This group of rustic figures, and that of the figure sat working with ropes in front of boat moored on the shore in the centre foreground, reflect the work of John’s brother James Burnet and David Wilkie. John Burnet was strongly influenced by David Wilkie, and produced a number of works in his style. It is generally accepted that Burnet’s better works were landscapes. Fish Market at Hastings allows Burnet to contrast the different textures of calm waters and rocks against a dramatic sky. His landscapes often feature animals like cattle and horses, reflecting the influence of Dutch seventeenth-century artists such as Aelbert Cuyp (1620-1691). The theme of fishermen at a market reflects the growing popularity at the beginning of the nineteenth century in depicting rural scenes. Hastings, like Brighton nearby, is situated on the southern coast of England. It became a popular bathing resort in the late eighteenth century. With its tall cliffs, the town also offered artists a dramatic setting for paintings. Burnet’s contemporary, john James Chalon (1778-1854) exhibited Hastings, Boats making for shore in a breeze (FA.234) at the Royal Academy in 1819. 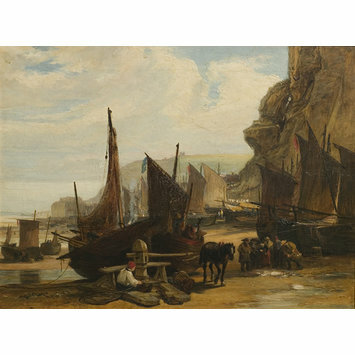 A more peaceful scene, Fish Market at Hastings probably dates from a similar period to that of Chalon’s dramatic depiction of this part of the Sussex coast. This and another oil by John Burnet Cows drinking (FA.6) were given along with two works by John's brother James, as part of the John Sheepshanks collection in 1857. Sheepshanks focussed on collecting predominantly contemporary British works. The presence of these works by both John and James Burnet in his collection reflects the regard which contemporaries held for both the Burnet brothers. Oil painting entitled 'Fish Market at Hastings' by John Burnet. Great Britain, ca. early 19th century.